Often touted as the 2nd largest Mardi Gras celebration outside of New Orleans, Mardi Gras in the South St. Louis neighborhood of Soulard is a multi-week celebration culminating with the Grand Parade and adult-themed street festival most people associate with New Orlean’s style Mardi Gras celebrations. This year’s Grand Parade is being held on Saturday February 10th. However, the festivities started on January 6th with 12th Night. What follows are some of the 13 best tips from seasoned veterans of the parade and festival. Mardi Gras traditionally falls in February through mid-March, which in are traditionally colder months. However, St. Louis natives know that although it may be the 40s in the morning, it could be In the 70s in the afternoon, and 20 with freezing rain by the night time. So be sure to wear lots of warm comfortable clothes. In a related tip, be smart about your choice of clothing, especially for Grand Parade Day. You will be surrounded be several thousands of adults, several of whom will be falling down drunk by noon, spilling their drinks with them, possibly soiling your shoes and clothes. So, leave the $500 boots and $1000 Louis Vuitton clutches at home. 3. Wear Pants with Pockets or Wear a "Fanny Pack"
You’ll need somewhere on you to keep your cash, cellphone, keys, Chapstick, and other necessary items. Backpacks and large bags aren’t permitted inside the festival area, so make sure your pants or jackets have deep secure pockets. You definitely do not want to be in the “day-after” group of people scouring the neighborhood for their missing keys, cellphones, or the aforementioned Louis Vuitton clutch. The Festival is primarily a CASH-ONLY event. Even bars and restaurants that take cards the other 364 days of the year will not be on Grand Parade day. Yes, there are plenty of ATMS strewn throughout the neighborhood, but their fees are often $5-10 on tope of your bank’s fees, and these ATMs often start running out of money mid-afternoon. Additionally, don’t forget to set some cash aside for the taxi ride home and/or the stop at Jack-in-the-Box on the way home. The entire Soulard Neighborhood is effectively a “No Parking” zone the day of the Grand Parade. Even the surrounding neighborhoods of Lafayette Square, McKinley Heights, and the area by Busch Stadium will be full by 10am. Several Bars and Restaurants operate shuttles to Soulard from Downtown, Laclede’s Landing, and the Grove. If you’re coming from St. Louis County or Illinois, consider taking the MetroLink from one of their Park-N-Ride lots. MetroLink light rail operates a regular shuttle from the Busch Stadium Station to the festival. 6. Use the "Buddy System"
At the very least, designate a meet up place (or intersection) in case you and your friends get separated. Soulard can be very disorientating if you’re unfamiliar with it – the buildings all start to look the same --and then add thousands of people and alcohol and it can quickly become overwhelming. 9th Street looking North towards the Arch and Downtown. This will help with the previous tip, especially if the cell towers are maxed near you. It also helps to know that Soulard is on a hill, so generally 7th Street and Broadway are going to be downhill, which also happens to be East towards the River. And conversely, the top of the hill is West and 12th Street (with Tucker and Gravois beyond). Additionally, for all intents and purposes, the Arch (if you can see it) will be North and the Anheuser Busch Brewery will be South. Get a printable map here or here. As mentioned in the previous tip, cell phone towers have been known to be overwhelmed by the sheer number of festival goers resulting in no or poor cell service. Although the organizers and cell providers have mitigated this in recent years by installing temporary towers, it’s still advisable to rely on text messages to communicate with your friends rather than phone calls and voicemails alone. They’re not ignoring you, just not getting you calls. With all of the revelers bathrooms will be at a premium. There are banks of porta-potties scattered throughout the Festival area, but these lines can quickly get more than 20-30 people deep, resulting in 30 minute waits or longer. If you must use a porta-potty it’s recommend to venture away from the more popular areas. Better yet, look for one of the pay bathrooms, or if you’re lucky enough to have a friend nearby, facilitate with them beforehand to use their facilities. 10. Going to a Friend's House Party in Soulard? Bring your potluck dishes, changes of clothes, and coolers the night before. Remember no backpacks, large bags, coolers, water bottles or any beverage bottles are allowed into the festival area on Grand Parade day. You will be turned away and/or the items confiscated at the entry checkpoints. Additionally, if you are going to a friend’s house, make sure you are on the correct side of the Parade Route. Once the Parade starts, there’s no crossing until it’s finished – 2-3 hours later. This was MY rookie mistake. 11. Where Do I Get Beads? Most Mardi Gras veterans will have handfuls of beads from Mardi Gras pasts that they may be willing to give to others, however they’ll likely ask for something in exchange. Free beads are readily thrown out by the Crewes on the floats during the parade. 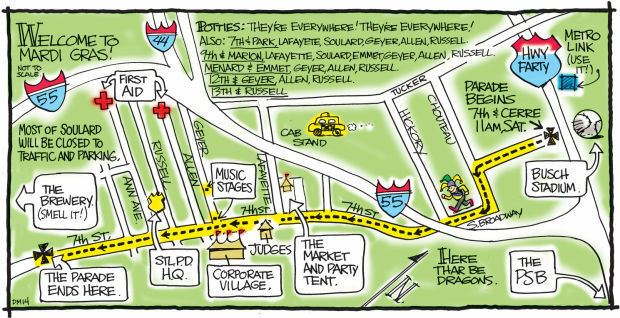 Some floats will run out by mid-parade, so if beads are your objective for watching the parade you want to be closer to the start (Busch Stadium) than the end (A-B Brewery) of the parade route. There are often traveling peddlers and bars and booths selling beads as well. 12. What About the Children? Worried about your young children being exposed to drunken idoits and corresponding exposed body parts in exchange for abovementioned beads? Perhaps skip the Grand Parade and Festival day and instead enjoy one of the more family-friendly events like the Family Winter Carnival or the Beggin’ Strips Pet Parade. The Pet Parade is said to be one of the largest Pet Parades in the world and usually brings out a lot of party animals ranging from Dogs, Cats, Goats, Horses, and in years past, even a dinosaur! While alcohol and Mardi Gras vibes are still present at these events, they’re usually a lot more relaxed and the exposed body parts are kept to a minimum. 13. Want to Celebrate, but also Avoid the Crowds? Then check out Soulard the weekend prior to Grand Parade day. Saturday and Sunday are the “Taste of Soulard” in which many of the bars and restaurants in Soulard will pass out samples of their signature food and drinks with the purchase of a “passport”. On Saturday’s “Taste” there’s even complimentary shuttles roaming the neighborhood taking participants among the participating venues. In addition to the 2nd day of the “Taste” Sunday features the Wiener Dog Races in Soulard Market Park and the Beggin’ Strips Pet Parade. Learn more about the full schedule of Mardi Gras events here. Whether you come out to Soulard for the Grand Parade, the Pet Parade, Taste of Soulard, or even just some random day in the future, please take the chance to absorb the Mardi Gras flavor that Soulard is known for.